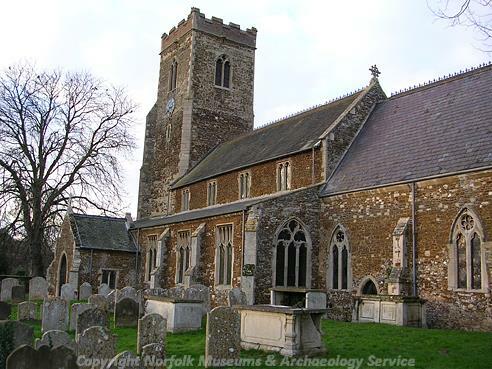 Middleton is a medium-sized parish in west Norfolk, close to King's Lynn and on the edge of the Fens. Settlement in the parish is fairly dispersed, and clustered in the small villages of Middleton, Fair Green, Tower End and Blackborough End. Middleton is a common place-name that comes from the Old English meaning ‘middle farmstead or estate’. The earliest archaeological artefacts from the parish are Palaeolithic flint flakes (NHER 3421) found during fieldwalking. Two prehistoric pot boiler sites (NHER 23011) were identified during fieldwalking in 1986. An evaluation carried out by the NAU in 1991 revealed that any burnt mounds associated with the pot boiler sites had been destroyed by ploughing. A series of pits and ditches of unknown date (NHER 37396) were revealed during trial trenching carried out by the NAU in 2002. The evaluation also recovered prehistoric flints and medieval and post medieval pottery and building materials. An evaluation carried out on the same site in 2003 revealed more ditches, possibly of prehistoric date, which appear to have formed part of two enclosures. A number of possible prehistoric pits were also revealed, which contained evidence of in-situ burning. 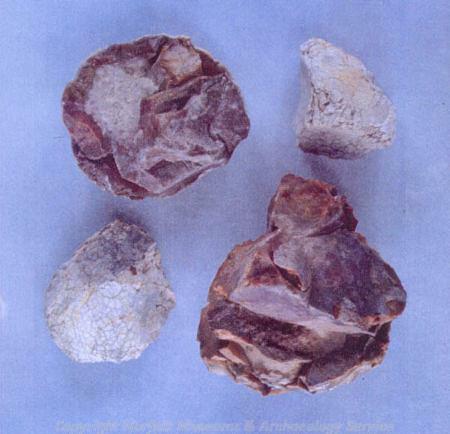 Prehistoric flints (NHER 3404), an arrowhead (NHER 24100) and a prehistoric saddle quern (NHER 3422) have also been found, as well as Mesolithic flakes (NHER 20855), Mesolithic or Neolithic scrapers and a blade (NHER 18537), Neolithic flints (NHER 3387, 23622, 32859), scrapers (NHER 3389) and Neolithic axeheads (NHER 3388, 3423, 11345, 16242, 16243). A Bronze Age scraper (NHER 3400), Bronze Age palstaves (NHER 19502, 24206) and a Late Bronze Age chisel (NHER 28121) have also been found. There is some evidence of the Iron Age in the archaeological record, including a silver Iron Age coin (NHER 3390), fragments of Iron Age pottery (NHER 3424), a penannular ring (NHER 25858), a vessel foot from an Iron Age or Roman vessel (NHER 28909) and an Iron Age brooch (NHER 36070). Two pot boiler sites (NHER 23205) were found during a fieldwalking survey. A fragment of Iron Age pottery was recovered from one site, and Roman pottery from the other, suggesting a possible Iron Age to Roman date for the sites. Blackborough End was the focus of settlement in this area during the Roman period, and evidence of other Roman industrial activity has been found in the surrounding area. In 1989 the remains of a Roman pottery kiln (NHER 3391) were discovered on the site of Kiln House. The kiln was producing Nar Valley ware, and was probably active in the 3rd century. Roman pottery, metal working debris, a coin and a potter's stamp have been found on the site, as well as Late Saxon, medieval and post medieval pottery. A further excavation was carried out by the NAU in 1991, but only a fragment of medieval pottery was recovered. The Roman pottery kiln is believed to survive below the floor of the garage of Kiln House. A late 3rd to early 4th century Roman saltern (NHER 23181) was excavated in Blackborough End in 1991 after detailed fieldwalking and an auger traverse had established its presence. An artificial mound of briquetage surrounded a sophisticated evaporation oven, and other evaporation ovens and settling tanks were found to the northwest of the mound. Over 11,000 pieces of briquetage were recovered from the site, which was probably industrial (rather than domestic) in its scale. 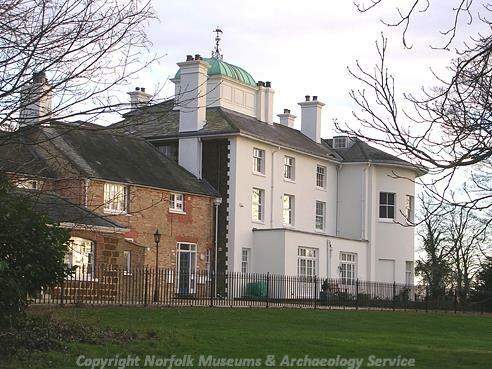 An excavation carried out on land near Sandy Lane in the early 1960s by the King Edward VII School in King's Lynn revealed the footings of a Roman wattle and daub wall, a post-hole, and fragments of Roman pottery and animal bones (NHER 3465). The site of a possible Roman villa (NHER 16287) has been recorded on the edge of Fair Green. Roman finds from the parish include fragments of pottery (NHER 3389, 3396, 17753), coins (NHER 3425, 3427, 17309, 28084, 28121, 28290, 29326), brooches (NHER 22009, 28121, 28579, 28583, 28909, 29325, 36070), an end-loop cosmetic mortar (NHER 28583) and a scabbard chape (NHER 29323). So far, no archaeological sites or artefacts from the Early and Middle Saxon periods have been recovered. Fragments of Late Saxon pottery (NHER 23818, 31614), a Late Saxon copper alloy box mount decorated with a human face (NHER 24141) and a coin from reign of Cnut (NHER 29075) have been found. In the Domesday Book Middleton was divided between a number of landholders, including the Abbot of St Edmunds, Count Alan and Hugh of Montfort. Salt making seems to have been an important local industry in the Late Saxon period, and more than ten salt-houses were recorded in the Domesday Book. The parish has a wealth of interesting medieval archaeology, including a courtyard house, a castle and a priory. Middleton Mount (NHER 3394) is a motte and bailey castle that was probably constructed soon after the Norman Conquest on the site of a Late Saxon estate centre. An excavation in 1987 revealed traces of Late Saxon occupation underneath the bailey. The excavation also showed that the castle lies within an earlier rectangular enclosure that may date to the Iron Age. The medieval moat that surrounds Middleton Towers is within an outer enclosure (NHER 3395) that is now visible as earthworks. In the northeast corner of the outer enclosure are the earthwork remains of two medieval fishponds, and other earthwork features within the enclosure probably relate to the post medieval gardens. A series of further enclosures lie to the east of Middleton Towers. These enclosures represent the medieval manorial site that passed to the Scales family in the 12th century. A rectangular building platform is probably the remains of a medieval dovecote, and the site of an earlier, circular dovecote has been recorded. The earthworks of a possible medieval toft and an associated enclosure fronts onto the lane. Fragments of medieval and post medieval pottery have been recovered from the site. The cropmarks and earthworks of an area of possible deserted medieval settlement and a moated site (NHER 11834) are visible on aerial photographs taken in the 1970s close to Middleton Mount. Fragments of medieval pottery and floor tile have been found on the site, which was destroyed during the construction of a golf course. Middleton Towers (NHER 3393) is the most impressive medieval building that survives in the parish. 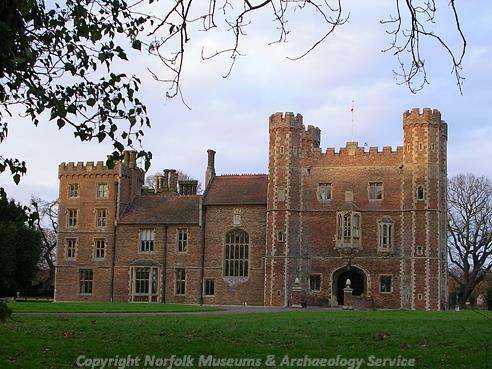 The gatehouse was built in about 1455 for Thomas, Lord Scales, and the original building was conceived as a courtyard house similar to Oxborough Hall, but there is no evidence that it was ever completed. The gatehouse, which was restored in 1864, is a rectangular three-storey building with polygonal turrets, an embattled parapet and shallow machicolations. By the 18th century the house was derelict, and little of the 15th century house remained, apart from the gatehouse. 18th and early 19th century illustrations show the gatehouse as partly ruinous, and the house was bought by Sir Lewis Whincop Jarvis in 1856, who restored the gatehouse and added the south range in 1864. The interior dates entirely from the late 19th and early 20th century. The bridge across the moat dates to the 1860s and 1870s, and has an embattled parapet with octagonal piers surmounted by a stone pineapple. St Mary’s Church (NHER 3419) dates mainly from the 13th century and was restored in the 19th century. The interior of the church has an arched braced roof supported on 19th century foliage corbels, a 13th century double piscina with holly foliage mouldings and a 16th century wooden alms box. There are several interesting 18th and 19th century headstones in the churchyard, including one to Robert and Christine Jarred, which has a relief scene of Jacob and Isaac, and several others with carved cherubs and pilasters. In the churchyard there is a 15th century limestone cross, as well as the remains of another medieval cross (NHER 3412). The Priory of St Mary and St Catherine (NHER 3430) was founded in Blackborough End in about 1150 by Roger de Scales and his wife Muriel. The Priory was originally intended to house monks but soon after its foundation it was functioning as a double house, with both monks and nuns. In 1200 it became a Benedictine nunnery and remained as such until it was dissolved in 1538. The probable south wall of the church and the gable end of a substantial medieval building are still standing, and dense spreads of building materials mark the sites of other buildings attached to the Priory. The earthworks of five medieval fishponds have been recorded on the site. Excavations in the 19th century revealed a number of burials, and medieval pottery, tiles and other finds have been found on the site in recent years. Several medieval settlement sites (NHER 23621, 23204, 23622) have been identified in the fields around Blackborough End, indicating that settlement was once more extensive in this area of the parish. The earthworks of a medieval moated site are visible on aerial photographs (NHER 3429) near Blackborough End, where an area of medieval ridge and furrow (NHER 22143) has also been recorded. An early medieval pottery production site (NHER 17915) was excavated by the NAU on Wormegay Road in 1982. The excavation did not reveal any permanent kilns, but it recovered a large amount of medieval pottery. Pottery was being produced on the site from the mid 12th century onwards. A medieval pot (NHER 3428) was found in 1940 during the construction of an air raid shelter. The pot is of Blackborough End type, and is almost complete. The cropmarks of a double enclosure, probably the remains of a medieval moat (NHER 31090) are visible on aerial photographs. Another enclosure on the site is probably a medieval fishpond. An area of possible deserted medieval settlement (NHER 16287) has been recorded from aerial photographs at the edge of Fair Green. A series of excavations during the late 1970s revealed medieval and post medieval occupation and property boundaries (NHER 17368) close to The Old Vicarage. The earthworks of at least two medieval tofts and medieval ridge and furrow (NHER 18547) are close to West Hall, in the west of the parish. The site is close to another possible ditched enclosure (NHER 31613), which is probably the site of another medieval moat. Mitre Farm Cottage and Oak Cottage on Setch Road (NHER 33849) is a 17th century carstone house that is now subdivided into two. Tower Farmhouse (NHER 41101) is an 18th century farmhouse built in coursed and galletted carstone with brick dressings. Close to the house is a 17th or 18th century barn (NHER 41102) built in similar fashion. The Crown (NHER 44659) is an 18th century public house built of colourwashed brick. The Old Hall (NHER 11962) is an early 18th century carstone, flint and brick hall built around an older core. The hall was once surrounded by a medieval moat that is thought to have been the home of the de Scales family before the construction of Middleton Towers (NHER 3393). The complex includes an 18th century dovecote and a range of 18th century barns that contain a large amount of reused medieval stonework. The carstone and brick garden wall has an octagonal turret. Medieval documents mention a deer park associated with the medieval house. Middleton Hall (NHER 3420) is an early 19th century house with a rendered façade and a central Tuscan portico. The elaborate interior of the house includes a large ballroom with plaster decoration and a marble fireplace. In the grounds of the house is the grave of a horse that survived the Charge of the Light Brigade in 1854. The horse was bought back to England by a member of the Everard family, and ended its days on the estate. The earliest record of a landscape park (NHER 31971) around Middleton Hall dates from 1800, and the park had perimeter belts, a kitchen garden and an American garden. The early 19th century Orangery (NHER 44661) is still standing, as is the Old Lodge (NHER 44663) which was built in the Tudor Gothic style in 1837. The small park around Middleton Cottage (NHER 31971), which was built in 1814, had shrubberies, a kitchen garden and pleasure grounds. In the early 20th century the park around Middleton Hall was altered significantly so as to appear almost continuous with the park around Middleton Cottage. Middleton Cottage was demolished after 1929 and a housing estate has been constructed within the park, and the remainder has been extensively re-landscaped to form a golf course. Manor Farmhouse (NHER 44660) is a carstone house with brick dressings, dating mainly from the 19th century but incorporating several 17th century elements, including brick dressings and blocked rectangular openings. An unaltered example of a mid 19th century estate house, Tower Cottage (NHER 41179) was built in 1861 in carstone and brick with decorative tiles, ornate brick detailing, octagonal chimney shafts and a Gothick doorway. Tower End Cottages (NHER 41178) are a pair of estate cottages built in 1906 in the Arts and Crafts style. The cottages are built of carstone rubble with dressed carstone for detailing. The pumping station (NHER 13759) on Middleton Stop Drain is on the site of a post medieval wind pump shown on Bryant's map of 1826. A steam-pumping engine was built on the site by Sir Lewis Whincop Jarvis in 1877 to lift water into the Middleton Stop Drain. The pumping station closed in 1934 and the engine was dismantled in 1975, but the scoop wheel and the chimney remain and are the only upstanding examples in the Norfolk Fens. The pumping station (NHER 17310) on Station Road dates from the late 19th century with cast-iron round-headed windows. Mill Farm is the site of two windmills (NHER 14992) that are shown on Faden’s map of 1797. A hydraulic ram (NHER 3417) stands within a wood close to Middleton Towers. The ram was built by John Blake of Accrington, a hydraulic engineer who was working in the early 20th century. On 23 November 1944 a Mosquito bomber (NHER 15526) crashed in the west of the parish on a training flight with the loss of both crew members. The site of the crash was excavated in 1975, revealing the remains of the wreckage. During World War Two a bombing range (NHER 23010) was located in the fields in the southwest of the parish. A Royal Observer Corps post (NHER 21969) was opened on the south side of the A47 in 1960 and closed in 1968. The post was reopened in 1989 after the flooding of the King's Lynn post, but was finally closed down in 1991. Sarah Spooner (NLA), 31 July 2006.